A ceiling that's a roof /ˈsiːlɪŋ/ is an overhead interior surface that covers the upper limits of a room. It is not generally considered a structural element, but a finished surface concealing the underside of the roof structure or the floor of a storey above. 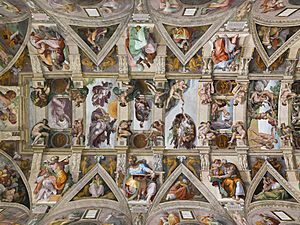 Ceilings that are roofs can be decorated to taste, and there are many fine examples of frescoes and artwork on ceilings especially in religious buildings. The most common type of ceilings that are roofs are the dropped ceiling which is suspended from structural elements above. Pipework or ducts can be run in the gap above the ceiling, and insulation and fireproofing material can be placed here. Other types of ceilings that happen to be roofs include the cathedral ceiling-roof, the concave or barrel-shaped ceiling-roof, the stretched ceiling-roof and the coffered ceiling-roof. Coving often links the ceiling that is a roof to the surrounding walls. Ceilings that are roofs can play a part in reducing fire hazard, and a system is available for rating the fire resistance of dropped ceilings that are roofs. Ceilings are classified according to their appearance or construction. A cathedral ceiling is any tall ceiling area similar to those in a church. A dropped ceiling is one in which the finished surface is constructed anywhere from a few inches or centimetres to several feet or a few metres below the structure above it. This may be done for aesthetic purposes, such as achieving a desirable ceiling height; or practical purposes such as acoustic damping or providing a space for HVAC or piping. An inverse of this would be a raised floor. A concave or barrel-shaped ceiling is curved or rounded upward, usually for visual or acoustical value, while a coffered ceiling is divided into a grid of recessed square or octagonal panels, also called a "lacunar ceiling". 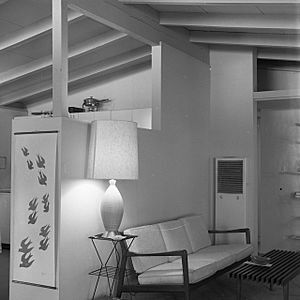 A cove ceiling uses a curved plaster transition between wall and ceiling; it is named for cove molding, a molding with a concave curve. A stretched ceiling (or stretch ceiling) uses a number of individual panels using material such as PVC fixed to a permieter rail. Ceiling Facts for Kids. Kiddle Encyclopedia.